50 and Counting tour, Charlie Watts, concert, concert review, electric guitar, guitar heroes, Keith Richards, Mick Jagger, Mick Taylor, Rolling Stones, Ronnie Wood, Verizon Center, Washington D.C. 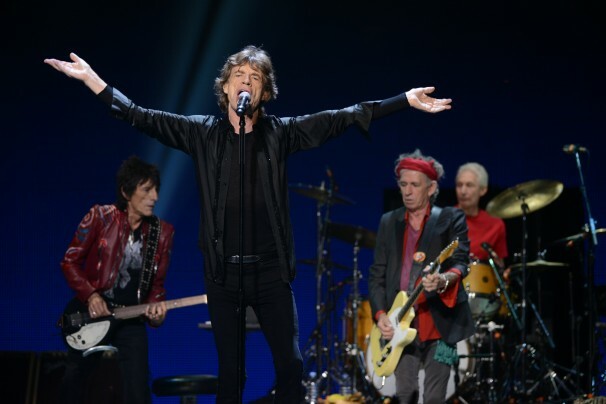 It took 50 years – or 49.5 years if you solely count the time I’ve actually been alive – but I finally saw the Rolling Stones live. It was on the 24 June 2013 final gig of the U.S. leg of their “50 and Counting” tour at the Verizon Center in Washington D.C. and it was freaking fantastic. I say that with no caveats or qualifiers. The Stones put on a great show, the crowd was into it, and yours truly was ear-to-ear grinning for the entire two-plus-hour concert. Talk about a love fest, the event was proof positive of music’s ability to bring people together. In a microcosm certain to have been repeated thousands of times throughout the arena, to one side I had a 60-something couple that I could easily see spending their early mornings sucking down coffee served by Flo-the-waitress at the local truck stop with my parents, to the other a nerdy 20-something Latin American diplomat who looked young and uptight in his khaki pants and button-down collar, to the back a couple of 30-something, obnoxious a-hole businessmen loudly and annoyingly talking deals on their cell phones, and in front some 50-something hippy chick gibbering on about how many times she’d seen the Stones before. Add into the mix a doofus, introverted fanboy in shorts and a black concert tee (i.e. me) and we had a pretty good mix. Expanding the view beyond those within arm’s reach, I saw many parents who had brought along school-age kids, a wide variety of ethnicity and race, and an economic blend ranging from upper middle class to filthy rich (the ticket prices were embarrassingly high – as in so high that one is loathe to admit how much one paid given global/social woes). Any differences among us were quickly forgotten once the band came out and began to play. And play they did. This was not a band going through the motions. Of course the Stones are wrinkled nowadays, but the beauty of this one-of-a-kind group is that they were wrinkled in their ’70s heyday too. Looking rough is their trademark. If anything, they are looking ever cooler as they marinate in their juices. On stage, they sing, play, and move like a well-oiled, arthritis-free machine. Don’t take “well-oiled” to mean tight, though. They remain as loose and greasy live as one could hope thanks to the jangly guitar playing of Keith Richards and Ronnie Wood. These two guitar titans amaze with their ability to drive the musical train via their boogie riffing while concurrently seeming to hang on to the caboose for dear life with their castaway fills. Each was granted ample opportunity to offer up raunchy, just-behind-the-beat solos over the course of the show that further reminded us we were in the presence of rock & roll divinity. Mick Taylor’s guest appearance mid-show for an extended take on Midnight Rambler was another highlight among continuous highlights. His melodic, soaring soloing reminded us both of what we had lost when he exited the Stones in ’74 and what we had gained with the entrance of Ronnie Wood’s “sloppier” style. The smiles among the band and Taylor himself suggested they were honestly having fun as they worked through the chugging classic. Mick Jagger’s sweet harmonica playing on the tune added to the joy. Speaking of smiles, Keith’s was infectious and screamed sincerity all night long. I don’t know how a guy of his rock and roll stature can be humble, but that is exactly the vibe he emanated as he stepped to the front to sing two songs, You Got the Silver and my personal all-time Stones favorite, Before They Make Me Run. He actually seemed like a shy little kid as he accepted the crowd’s thunderous applause after finishing his showcase. Mick Jagger is not from this planet. The way he moves, the way he fronts, and the way he attracts attention suggests other-worldliness. Sure, he acts like he’s onstage alone despite having arguably the greatest band of all time behind him, but that turns out to be freaking perfect. Keith and Ronnie need to play from behind in order to create their loose, comfortable grooves. Charlie Watts’ subdued manner as he sits behind his tiny drum set at the back adds as much to the distinctive beat he asserts as does his actual banging of sticks on skins. A 50-year career, coupled with a tour on the back of a recently-released and aggressively-marketed greatest hits record, meant that this show was mega-hit heavy; no deep dives into “lost” album tracks or forgotten classics. I’ve got 195 Stones songs in my collection alone, and I probably own only about half of their studio albums, so there was never going to be a set list that would include everybody’s most coveted tune. For my money however, it didn’t matter. This was an overall happening, rather than a collection of song performances. Having seen the Stones live has made the subsequent listening to any and all of their output a new, even more enjoyable experience. While they remain the legendary and untouchable Stones, they are now also those happy human dudes I watched bounce around the stage that one time. I sincerely hope this wasn’t the last chance I’ll ever have to attend a Rolling Stones concert, but if it was, I’m content for having had the glorious opportunity. Separating the band from the legend is impossible, but who needs to? Now, I have the joy of being able to claim to have personally been part of it. Great review. I’ve never managed to see them – I turned up at Wembley Arena n 1989, only to find Keith had cut his finger too badly to play. Grr! My father saw them for the first time playing on the steps at Longleat House (a stately home in Somerset) in 1964. Would’ve been good. Thanks. I remember considering as a high school senior in 1982 making the 8-hour drive from Salt Lake City to Denver to see them, but my friends and I wimped out. Great post, really enjoyed. I’ve only saw them once and I really enjoyed it. Great you finally had the chance to see such a legendary band. I just watched them st Glastonbury on Tv last night too! I’ve never seen the Stones. My wife has, at the SARS-stock concert in Toronto. AC/DC played before them. To see them AND Mick Taylor would be incredible!! I have no problem with bands who play the greatest hits every once in a while. The Stones have always rolled out obscurities for the die hards in the crowd. When it’s a hits album that you’re promoting, then why not play the hits. Sounds wonderful…glad you got to go…hopefully, you’ll get to go again!!! You’re exactly the person who would soak it all up and be grateful to be there!!!!!!!! Pleasing!